Using quotations, anecdotes, and a heartfelt desire to inspire people, this website is my attempt to help others “build their wings” and live a life of Daring Ways. 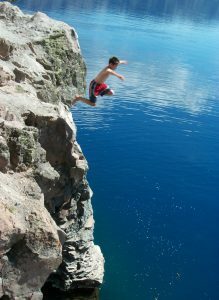 To the left is my son, Michael, jumping into Crater Lake at age 13. When he jumped he didn’t know the water temperature was a cool 60 degrees. He had not seen anyone else jump into the lake. And, he was the first in our family of four to make the leap. At that very moment he embodied the spirit of Daring Ways. The content of Daring Ways is based on a lifetime of experiences. In the past few years, faced with medical obstacles never imagined, I decided to leap into my own proverbial lake and create this website. In the future months, I will be posting essays intended to inspire readers to create their own Daring Ways. The first essay, Daring Ways Genesis, explains the origins of Daring Ways. Also, you can read more about me on my Bio page by clicking on my name below. I hope you enjoy Daring Ways and I look forward to your comments. I encourage you to subscribe to my Blog via e-mail (on the sidebar) and you will receive notifications when I post new essays on this website.